The editorial project is the outcome of a long-term common research experience on archaeological topics and contexts pertaining to ancient Italy, Greece and, in general, the Mediterranean basin. Furthermore, it is based on the previous shared editorial projects, promoted by the founders of this initiative, who are architects and archeologists united by in-field experiences, that turned out to be decisive for the adoption of a methodology open to debate and aware of the importance of a multi-disciplinarian approach. These common experiences, especially in Greece, during the long period spent in the Italian Archaeological School at Athens, resulted in the awareness of the need to foster the cooperation between archaeologists and architects as well as to integrate different competences, with the aim of ensuring an overall understanding of the ancient world. A crucial role in the definition of the project was played by the needs emerged throughout these years of academic teachings, working with young students who are starting their research activities and who are asking for information materials that are both updated and easily accessible as well as a space of scientific communication. Taking into account this aspect, the participation of researchers, professors and officers of Italian and foreign Universities, of institutions connected to promotion and valorization of cultural heritage, or even independent scholars, who are willing to establish a network able to concretely go beyond the divisions and fragmentations currently existing within the traditional system of publications, it is most welcomed. Thiasos is an online open access journal, which has been rated as a class A journal by Anvur (the Italian rating agency for scientific journals) using the VQR ranking system (Research Quality Evaluation) for the sectors CUN 08/E2 (Architecture) and 10/A1 (Archaeology). The objective of the project is to make a scientific journal accessible, by providing it with a scientific and articulated editorial context, uniting the publication of the researches’ results and complementary services, thus becoming a place where to carry out in-depth studies and to update already existing works. The name of the Journal, Thiasos, refers to the sense of belonging to a group, in this case a group aimed to implement studies and researches. The journal is a easy-to-use tool to spread results, to go beyond the current state of art and to develop further studies on the main topics concerning the classical archaeology and the ancient architecture. Participation is open to all those who wish to contribute with scientific articles and papers coherent with the journal’s research approach; the scientific quality of the proposed works have to undergo an evaluation, to be assessed first by the Director and the Steering Committee and then by the external Italian and international referees, as the journal uses the double-blind peer-review process. The journal is complemented by the Supplementa, that are collections of papers connected by specific themes, originated, inter alia, from seminars, meetings or call for papers. Due to the monographic nature of the Supplementa, they can potentially be published also in paper edition, that can accompany the electronic version. The website offers also a series of complementary information services, such as a space where news regarding recent publication and a virtual library are provided. To the just mentioned services, also a connection to Απεργον, a further online open access journal initiated by the same working group promoting Thiasos, is provided. 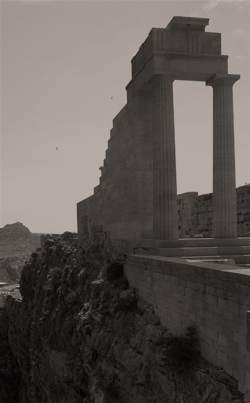 Απεργον is aimed to document the research activities annually implemented by publishing the “Proceedings of the research group on Ancient Architecture and Archaeology”. It offers information about the missions’ participants, duration, investigated areas and about the other initiatives carried out by the research group, such as exhibitions, conferences and seminars. The journal goes along with an editorial series of volumes (in paper edition) pertaining to the same topics, whose aim is to give space to monographic studies and to encourage the publication of proceedings of conferences and seminars. During last years, the series’ relevance gradually increased, publishing the outcomes of the group’s researches but also of significant studies by Italian and international scholars, in addition to national and international conferences.